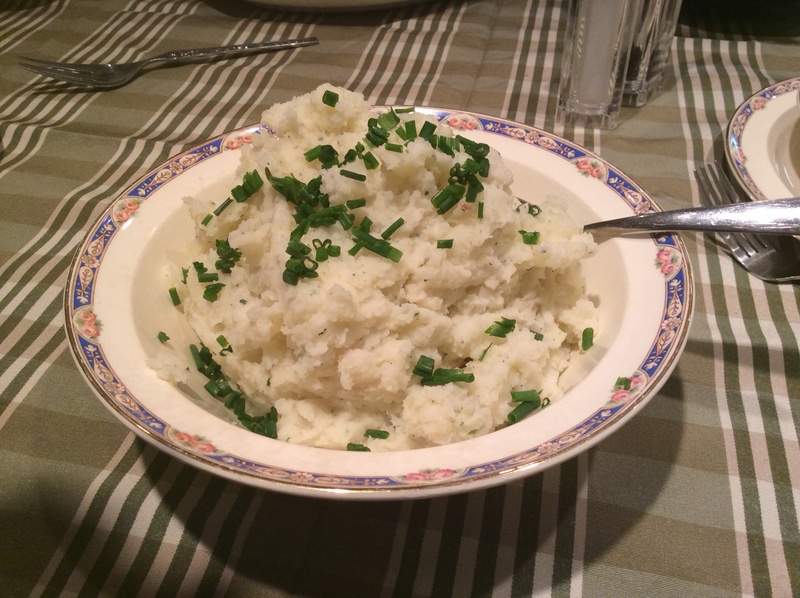 These are the potatoes I made for this year’s St. Patrick’s Day dinner. I had heard about these so many times but had never made them. I thought they came out really delicous-and they couldn’t be easier to make. Boil, mash, sprinkle, bake. That’s it. I used Red A potatoes. They were perfect with the corned beef and cabbage-neither of which I cook the traditional way. Bring a pot of salted water to boil. Add the potatoes and cook until fork tender. Drain the potatoes and set aside. On a large baking sheet drizzle the olive oil. Place the potatoes a bit apart from each other. Using a potato masher gently press down to mash a bit then turn the masher 90 degrees and gently mash a bit more. Drizzle with olive oil, sprinkle with salt and pepper and rosemary and bake for 20-25 minutes until golden and crispy. Note: one of those eating with us has a sodium intake restriction so I did not salt the water. 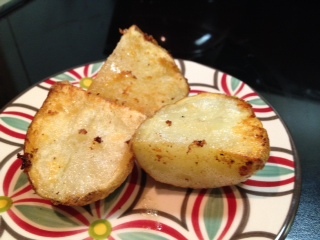 I made one row of potatoes with a large gap from the others and did not sprinkle any salt on them. What a convenient way of accommodating a restriction yet making the same dish for all. This year for St. Patrick’s Day dinner I made my corned beef, cabbage and potatoes. Truth be told I’m not a fan of boiled cabbage. Or boiled potatoes. I probably roast vegetables 99% of the time that I make them. They get just a little crunchy on the ends and they are so so so yummy. And cabbage is so good for you-you don’t want to boil all of that goodness away. 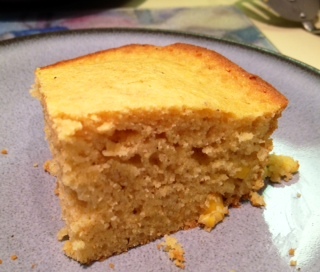 I was so glad to find this recipe! The addition of the dijon really intrigued me and I we were not disappointed. The cabbage was delicious! It was cooked perfectly-firm and a bit crunchy on the tips not at all like boiled. If you’re looking for a new way to prepare your cabbage try this-it’s excellent. It’s cut into wedges before it’s roasted which makes it a snap to serve-everyone gets a wedge. Combine all ingredients in a small mixing bowl and whisk to combine evenly. 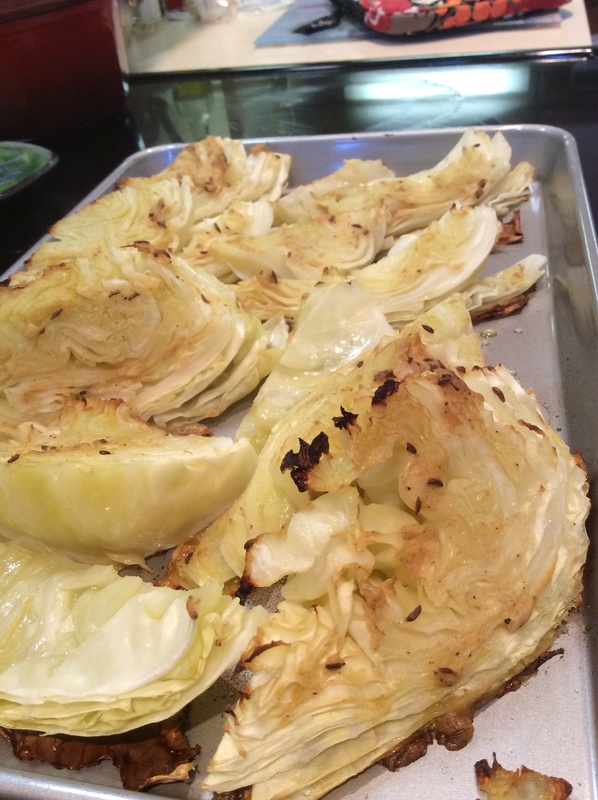 Line a rimmed baking sheet large enough for all of the cabbage with foil. 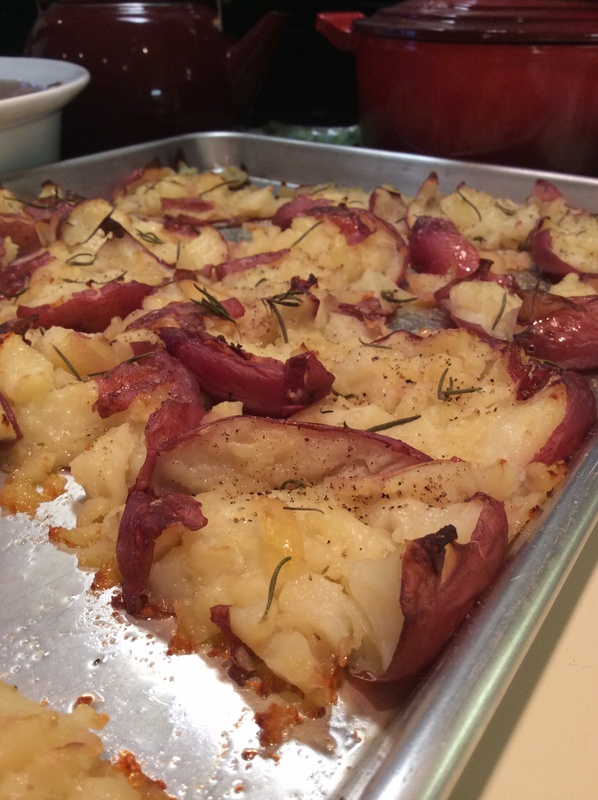 Place the wedges (not overlapping) on the baking sheet. Pour the mustard mix evenly over the cabbage and cover with another sheet of foil. Roast in the oven for 40 minutes, remove the foil and roast another 10 minutes. I don’t think that there’s anything better with pot roast than mashed potatoes. For my Christmas Eve dinner I served these potatoes with this pot roast and these roasted veggies. 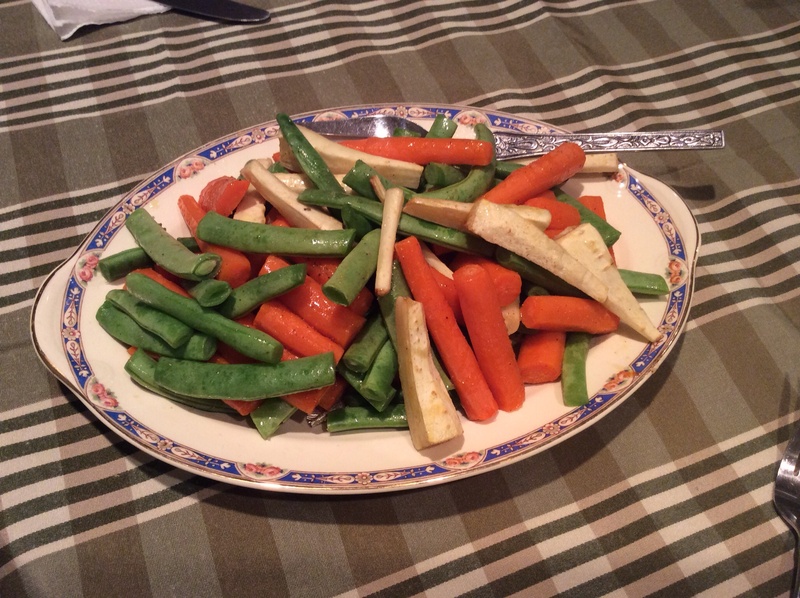 I had pinned this recipe quite a while ago and was so glad that I made them! The lack of butter and cream made me feel better about eating them, the sour cream and ranch flavors made them tangy and savory and delicious. Place potatoes in a large pot and cover with cold water. Bring the water to a boil, lower heat to simmer, and cook uncovered for 10-12 minutes or until potatoes fall apart when pierced with a fork. Drain the potatoes in a colander and return them to the large pot. Mash them up until smooth. Stir in seasoning and sour cream until evenly blended. Place in serving dish, sprinkle with chives and serve. 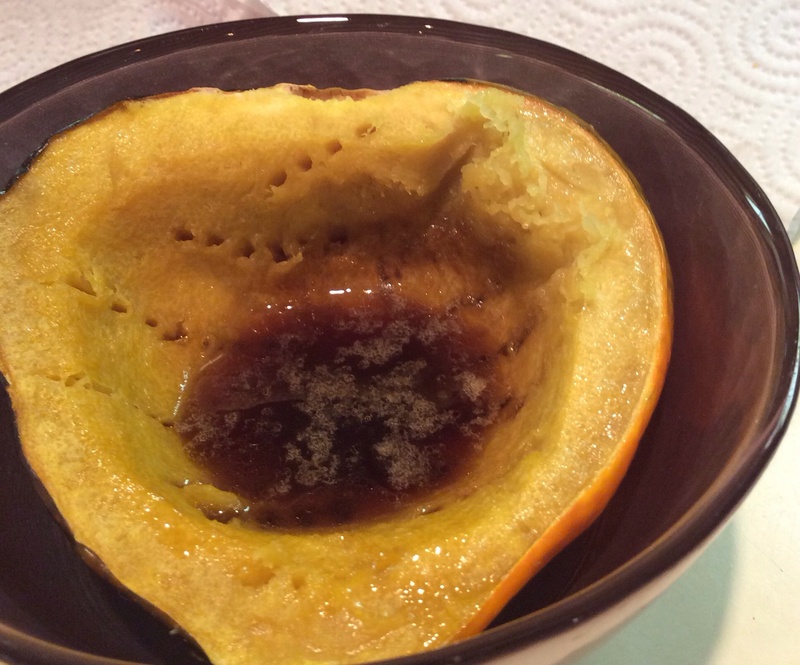 Recently I was looking around online for a recipe to use up some left over pumpkin puree and I found this. The name intrigued me. Pumpkin and Shiitake? Meh…I wasn’t sure about it. But then as I read down the list of ingredients I knew that I had to make this and soon. And am I glad that I did! It was perfect. Crunchy pignoli nuts, creamy rice, hints of pancetta, onion and pumpkin and just a bit of tang from the mascarpone (which I doubled). I had a double serving. 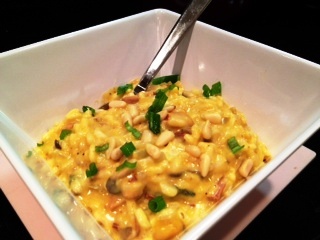 Many people think that risotto is difficult to make or easy to mess up. Lies. You can’t just let it sit on the stove but all that it takes really is attention and stirring. If you haven’t ever tried to make risotto at home I urge you to do so. There’s almost no prep involved either-just chop up an onion and some mushrooms tops and that’ s about it. Easy peasy. Risotto is like mashed potatoes. Some like it looser, some like it dryer. I prefer it looser and for to spread a bit when it’s spooned out. If you prefer it dryer continue to cook past when the liquid is absorbed. Be sure to not over cook it though-you do want it to be slightly toothy in the interior of the grain but creamy on the outside. Best to taste as you go. In a small sauce pan bring stock and water to a simmer. Keep it warm over low heat. Heat a large sauce pan over medium heat. Add the pancetta and cook about 7 minutes or until crisp, stirring frequently. Add the mushrooms, onion, garlic and cook about 5-8 minutes or until tender. Add the rice and sage, cook, stirring for a minute. Add the wine, scrape and brown bits from the bottom of the pan with a wooden spoon, and cook until liquid is absorbed. Add 1 cup warm stock and, stirring continuously, cook until it’s almost entirely absorbed. Repeat with all of the stock. You can use extra water if needed. About 20 minutes. Remove the pan from the heat, add the pumpkin and mascarpone and stir to evenly distribute. Taste and season with salt and pepper if needed. 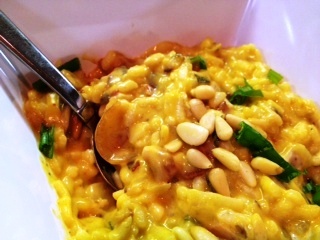 Spoon 1 cup risotto into 4 bowls (warm them so that the risotto doesn’t seize) and top with pignolis and chives. 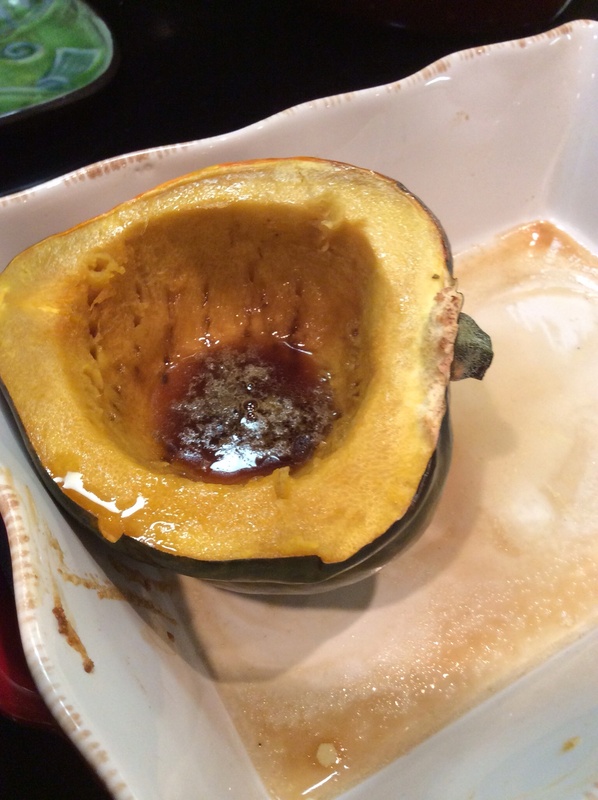 Note: do not use pumpkin pie filling. Serves 4 (or 2 of me 🙂 as a main dish or more as a side dish. It’s time for another Blogger’s Choice Swap! This month’s theme was ‘Vegetarian’ and I was assigned Katie’s blog www.sotastysoyummy.blogspot.com. She has some really great recipes on there. If you’re familiar with my blog or me you know that I love Parmesan cheese (and most other cheeses really) so when I saw this recipe I chose it immediately. Baked Parmesan Potatoes? YUM!! They’re super simple to make and are really delicious. I had one potato as a side to a fantastic salad that I made one night. They come out crispy on the outside and fluffy and creamy in the middle. The parmesan and butter make a slight crust along where the potato sat in the pan. Pour the melted butter into an 8×8 baking dish and then sprinkle the parmesan cheese and garlic powder evenly over the butter. Place the potatoes, long cut side down, onto the butter. Brush the skins lightly with olive oil and season with salt and pepper. 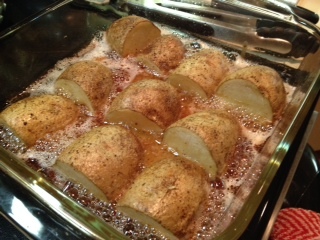 Bake for 30 minutes then turn the potatoes so that the short cut side is in the butter. Bake for another 5 minutes. Remove from the oven and allow 5 minutes to rest. 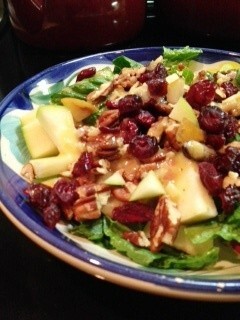 Thank you Sarah at http://tasteofhomecooking.blogspot.com for hosting these great swaps!! 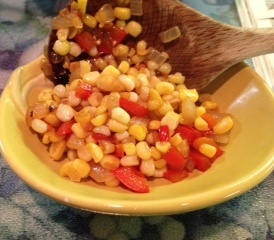 Sweet yellow summer corn, crunchy red bell pepper, tangy onion and savory garlic all sautéed in a touch of butter and rounded out with just the tiniest hint of soy sauce. This might just be one of the tastiest sides I’ve ever eaten. It’s so easy that someone who’s never cooked before could master it on the first try. It’s tasty enough to serve alongside with anything at the fanciest of restaurants or the most casual of tables—and it’s just really pretty to boot. 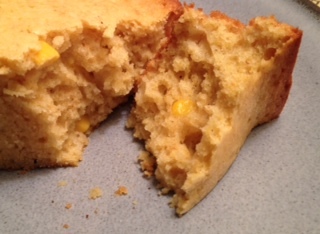 Note: the original recipe called for frozen corn but since delicious sweet corn is still available at the market I used that instead. Feel free to sub the frozen corn when fresh is not available. In a large non-stick skillet over medium-high heat melt the butter. Add the onion, red bell pepper and garlic and saute about 4 minutes. 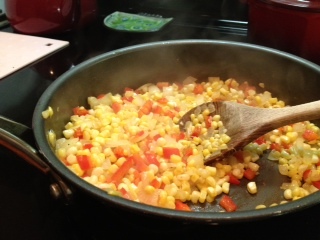 Add the corn and pepper and saute until the corn is cooked through and starting to soften. Remove from heat, add the soy sauce and stir to incorporate. Serve immediately. Adapted from Bell Pepper and Corn Saute Cooking Light October 2013.